Thanks to everyone who came out to the School Board public hearing on Saturday. Forty-four people spoke with more than double that in the room total in support of our schools. If you didn't make it, you have one last chance to talk to the School Board in person at their regular meeting this Tuesday, January 28 at 6:30pm. Call (571)-252-1020 to sign up to speak in advance or sign up in person before the meeting. The budget is on the agenda, so it's fair game. 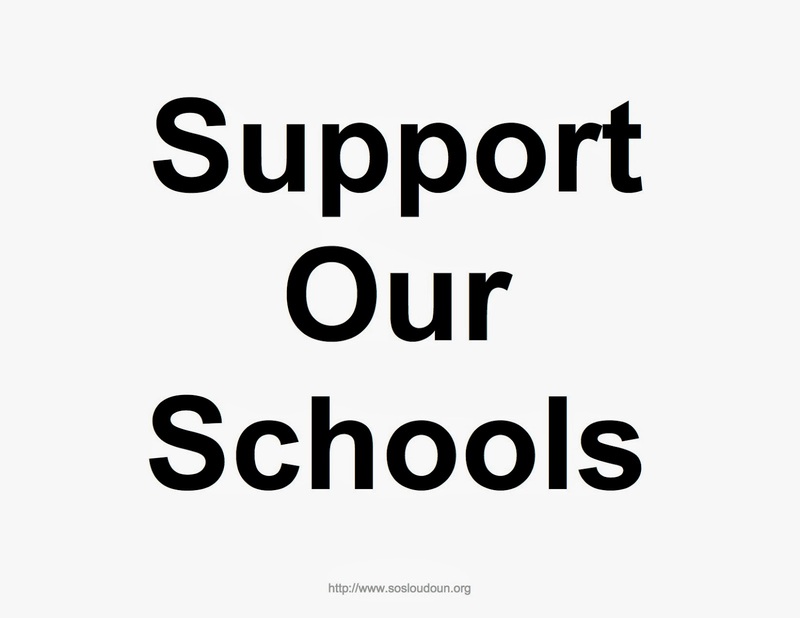 This is your last chance to let them know you want them to request a budget that supports our schools. Please download, print, and copy and bring to the public hearings for yourself and your friends and anyone else who'll take one. Hold it up when someone is saying something you like. What a great turnout tonight at the Board of Supervisors meeting. Thanks to all who came! Shout out to all the teachers - please keep coming - but now we need more of the parents, taxpayers, business owners, and community leaders to join them! (Granted, it was short notice.) Hopefully, you're already planning to attend the School Board Budget Public Hearings on Thursday, January 16 and/or Tuesday, January 21. Both are at 6:30pm at the School Administration Building in Ashburn. Sign up to speak by calling (571) 252-1020 in advance or register at the door prior to 6:30pm. At the meeting tonight, most if not all of the Supervisors told us they support education and understand how hard teachers are working. They want us to let the School Board know what we want funded, and then they'll look at that budget request along with the rest of the county budget beginning on February 5. Supervisor York wanted to make it clear that although the tax rate will be advertised based on the County Administrator's budget presentation February 5, they will be willing to re-advertise a new rate in order to go above that advertised tax rate. 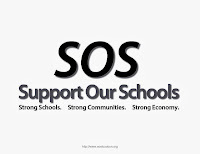 The message was clear that we now need to get the School Board to pass a budget that funds what we really want for our schools regardless of any preliminary fiscal guidance the Board of Supervisors has given. Once we get that done, we need to go back to the Board of Supervisors and tell them to fund it. 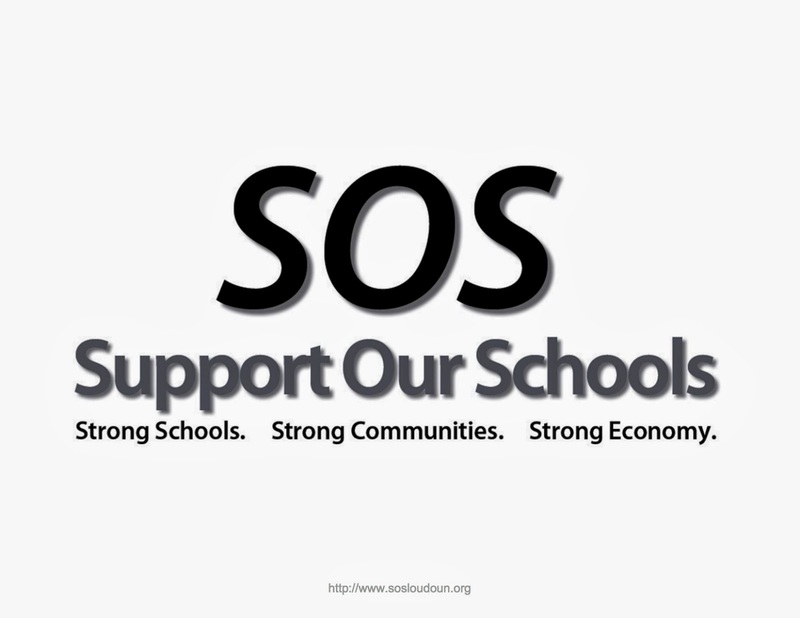 It's a slow process, but we will show that Loudoun supports our schools. P.S. If you can't make the public hearings, please remember to call or email your representatives with your thoughts. Actually, please do this even if you can make the public hearings. The Finance Committee met last night and heard an update on the fiscal situation for FY2015 from the County Administrator. The good news: there's $31 million in new revenue for the schools with the equalized tax rate. The bad news: the committee didn't adjust the fiscal guidance in any way, and scoffed at times at the notion of going above a flat rate. It's clear that the committee members have seen your emails and heard your phone calls -- Supervisor Reid openly worried about leaving too little to fund the schools -- but it hasn't been enough. Tonight is the last Board of Supervisors Business Meeting before they will direct the administrator to advertise the tax rate. Once that rate is advertised, it can only be decreased. It's a cap. That vote is expected on February 5, AFTER the School Board has proposed their budget and BEFORE public comment at that meeting. Tonight, then, seems to be the only time to address the BoS in person to let them know you support an investment in our schools. Sorry for the late notice, but if you can make it, please do. The meeting is held at the Loudoun County Government Center at 1 Harrison St, SE in Leesburg. Call (703) 777-0200 by noon today to sign up to speak or sign up in person at the meeting by 6pm. Bring a friend! 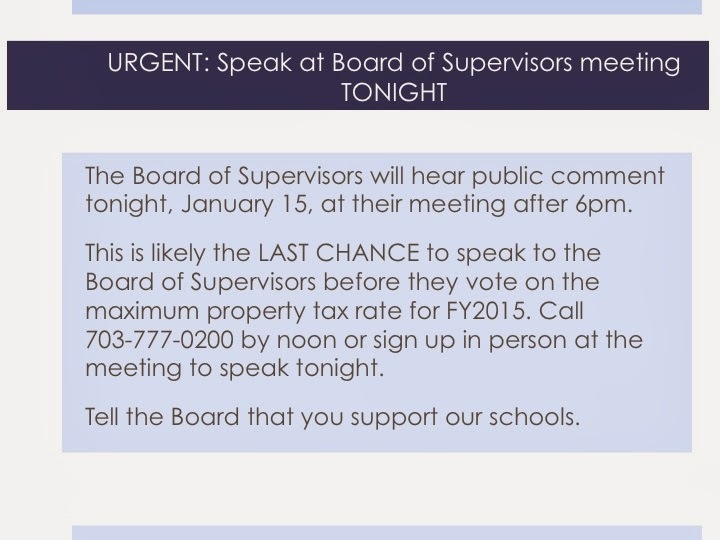 Thursday night (1/16) is the first School Board public hearing on the budget. Tuesday night (1/21) is the second and final School Board public hearing on the budget. The Finance Committee last night expressed confidence that the School Board budget will come in at the equalized rate or below, which would be cutting $55 million from the Superintendent's proposed budget. You can still work to prove them wrong by speaking at one of the School Board public hearings as well. This past week Superintendent Hatrick presented his proposed budget to the School Board. It calls for a 13% increase over last year. The Board of Supervisors had asked for no increase. If all of the budget gap was covered by an increase in property taxes, that would require a increase in the current tax rate by about 5.5 cents. The Finance Committee of the Board of Supervisors will be meeting on Tuesday, January 14 to vote on their suggestion for the advertised tax rate for the county. Their vote is generally accepted by the Board of Supervisors at their next meeting, which is Wednesday, January 15. Once the tax rate is advertised, it will not be raised, only decreased. We need to urge the Board of Supervisors to advertise a tax rate to cover the proposed budget. Contact the board and let them know that's what you want. Let's at least keep it high enough that we can have the discussion on what to fund. Otherwise, the choices are much more limited. To contact the board, call 703-777-0204 or email them at bos@loudoun.gov. Plan to attend the Loudoun Education Alliance of Parents (LEAP) meeting this Wednesday at 7pm at the LCPS School Admin Building in Ashburn next to Clyde's. Superintendent Hatrick will be presenting his proposed FY2015 budget for the Loudoun's public schools. It is open to all parents of LCPS students and members of the public. If you can't make it on Wednesday, he will also be presenting the budget to the School Board the day before on Tuesday from 6:30 - 8:30pm at the same location. The LEAP meeting is generally a more informal setting where the speaker takes questions from the attendees. As you should be aware by now, the Board of Supervisors has asked for a county budget without an increase in property tax revenue, as well as one with a decrease in property tax revenue. Dr. Hatrick is expected to present a budget that increases spending over the previous year, especially since enrollment is still expected to rise. The Washington Post presented a great recap of the situation in today's paper http://www.washingtonpost.com/local/as-loudouns-school-budget-cycle-begins-hatrick-warns-of-the-effects-of-budget-cuts/2014/01/03/8c6417ea-6bee-11e3-aecc-85cb037b7236_story.html. After the budget presentation, it goes into the School Board's hands. Since this School Board has been in office, they have cut the proposed budget before sending it to the Board of Supervisors, who then cut it again. In the past, prior School Boards cut less (at least once they didn't cut it at all), since the Board of Supervisors never seems to fully fund their request. This School Board has been different, making large cuts first. It hasn't made a difference -- the Board of Supervisors has still made their own large cuts, resulting in even larger cuts overall from the proposed budget. It remains to be seen if the School Board will make their own big cuts again this year and how much they will try to convince their counterparts on the Board of Supervisors to fund their request. It is time to get involved. Start with one of the presentations this week. 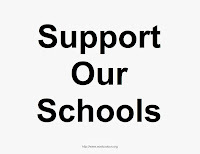 Follow it up with at least one of the School Board public hearings on the budget the 14th and 16th. Plan to attend BOS meetings too. (See the full calendar here.) Tell your friends. Share this page and/or the Facebook page and/or Twitter. 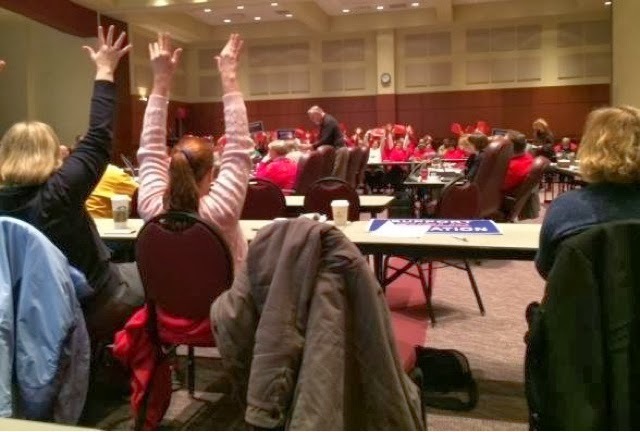 Pull out your gloves, because the fight for Loudoun's schools is about to begin.